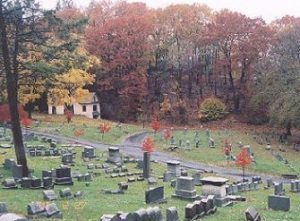 The Charles Baber Cemetery, consisting of 25 acres of land situated in the middle of Pottsville between Twelfth Street and Sixteenth Street, serves the community as both a cemetery and as a garden park. As the city’s largest natural “green space”, it is used by adults and children who walk it, bike it, and jog it. The nearby school district uses it for outdoor classroom studies and as a course for their athletic teams to jog through. The school children use it as a transit between school and home. 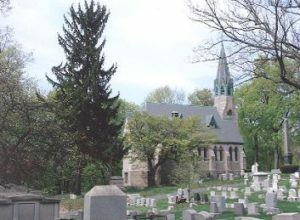 It has a stone Gothic chapel with a bronze columbarium, an Egyptian Revival style entrance with two gatehouses, a long stone wall fronting Market Street, a carriage house, a pond, a meditation area, and an enormous variety of trees. Between the grounds and the buildings, there is always much work to do. The garden cemetery employs two full time and one part time laborers for daily ground and building maintenance. General repair work includes painting, plastering, and small roof repairs of the buildings. It also includes ground repair work like filling in sunken plots and straightening leaning or toppled headstones. Ground maintenance includes mowing, weed whacking, leaf raking and vacuuming, shoveling snow, cutting and pruning smaller dead trees and limbs, and service maintenance of the equipment. Outside contractors are employed for major jobs like the cutting of large dead trees, snow plowing, major repairs on the chapel and for road and drainage work. The garden cemetery operates on an annual budget of $110,000. Its single largest expense is for the labor force. Income to cover the expenses comes from several sources: donations through the annual donation request letter, bequests, sale of plots and columbarium niches, Arbor Day tree sponsorship, and from interest from the endowment account. However, these sources of income only cover 60% of the expense with the remaining 40% being withdrawn from the investment account. This investment account, which was formed in the 1980s from several bequests from Trinity Episcopal Church parishioners, is slowly dwindling. This is why donations, monetary gifts, and bequests are vital to reduce the dependency on the withdrawals from the investment account. Preserving the Charles Baber Garden Cemetery, with its many benefits to the community, is the primary goal of the board. The natural resources like the trees, the shrubs, and the spring fed pond support the environment by providing oxygen, cleaning the air, housing a multitude of perching and breeding places for the birdlife, butterflies, squirrels, chipmunks, and groundhogs. This garden park provides a large acreage of “green” space to the residents of the community. The paths, trails, and roads service the walkers and joggers, including the school children who cross the property on a daily basis, and the parents and grandparents pushing baby strollers or walking their toddlers. 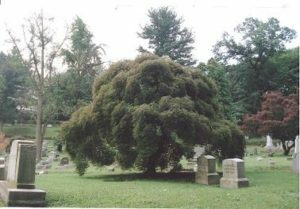 Burial and grave site visitations at the cemetery offer pristine grounds and a tranquil, comforting setting of trees, shrubs, and singing birds,. And the beautiful Gothic Chapel, with a bronze columbarium on either side of the entrance, offers summer Sunday church services and a chapel for funeral and wedding services. All of these benefits that the community, the adults, the school children, and the families of deceased loved ones use and enjoy today are worth safe guarding for future generations to have and enjoy as well, as is the preservation of the land as a large “green” natural environment. This picturesque garden cemetery can be preserved and maintained by your financial support in several ways: (1) through contributions of any amount to the general operating fund for daily ground care and maintenance; (2) through contributions to the garden cemetery’s endowment account with the Schuylkill Area Community Foundation which protects the invested principal balance with annual distributions of only the interest earned on the investment; and (3) through tree sponsorship for the Arbor Day tree replacement program which removes old diseased or dead trees and plants new trees. Please see the attached links for the forms to make a contribution to the area you are most interested in.